Do you really need another raving review of this book? Yes? Okay fine. LOL Do you remember when Six of Crows came out? Everyone was talking about it and how it was not even considered Young Adult because how well done it is. Well, this book right here is the new Six of Crows phenomenon of 2018. The best thing? It’s a Debut Author!! Complex, detailed and enchanting, this book left me at awe. The fact that for the first time I feel like a YA fantasy novel tackles the magical world like real adult fantasy books really surprised me. It is a very long book for YA (around 700 pages). It was worth every word of it. (Warning: if you have some difficult time to get into the book due to the details of the world building, please proceed to the exit door , I mean please proceed anyway because a lot of action scenes and interesting plot revealing right after). The author mentioned how she was inspired by her West African heritage. She did it perfectly and brilliantly by blending culture reference and magical aspects. I find this very exciting because the African culture has so much to offer and they contributed to the popular “magic” that we know about. So it’s nice to finally read about it! That are the qualities of the main character. I know you need this book. You are welcome. Bonus point: the villain is amazing!! I don’t want to spoil EVEN A LITTLE bit so I will leave you with that. I honestly didn’t like the romance, it was not necessary. I thought the author could develop so much more interactions between the characters without all that romance adding in every single time. THE ACTIONSSS. Chase scenes, sword fights, omg. Thank you to the publicist for giving me a free copy to review ! Never heard of this before. It sounds pretty good! Will keep my eyes out for it on the bookshelves. This book sounds awesome and every review I have seen so far seems positive. Will definitely be reading this at some point. Loved yer review. Great review! I just finally added my name to the hold list for this at the library. It honestly didn’t sound all that interesting to me, but with all the great reviews I’ve read on it I feel like I need to check it out now. I have only ever heard great things about this book! I cannot wait to finally get to it! Great review!! I’m dying to read this, I’m definitely buying a copy soon. Thanks for an awesome review! Did you guys change your blog format? Or is it just for this post? I clicked on “visit” to read this and wham, everything was different! And the homepage is changed too!!! so I guess I just answered my own question above. Your review pretty much mirrors my feelings aside from the romance haha. I am so antiromance, and I felt she kept this aspect so limited that I was more than ok with it. It seemed like such a blip in the grand scheme. A successful debut that raises so many relevant topics to light through brilliant and intelligent storytelling. I loved it. Great review Trang! OOOOH HELL YES I gotta find a copy! How could you make a review sound so interesting?! It’s settled, I’m gonna read this book though I haven’t heard of it before. I am reading this book at the moment and I totally agree with your review!! Fantastic review, Trang! I’m glad you loved this book! I’m actually planning to read it before the end of this month and your review has made me even more excited. Yaay, I’ve been excited for this and your review just made me more so! I just added this book to my tbr and I’m soooo glad to see you loved it!! I definitely can’t wait to give it a try! The world building and characters sound *incredible*. I do get that romance doesn’t always feel necessary. Great review! I’m a welder! That’s cool! It’s be fun manipulating metal – you’d never run out of stuff to use given we use it in just about everything! 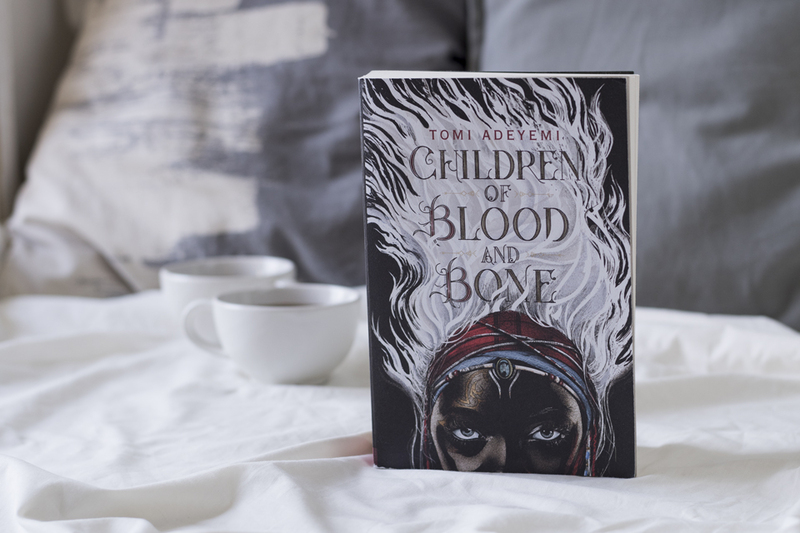 I really love the magic of Children of Blood and Bone so so much! The book was amazing, I loved so much! Which character was your favourite?